The Cox Report indicated that the Peoples' Republic of China had thoroughly infiltrated the American weapons research lab in Los Alamos. Immediately, Democrats and Republicans began accusing each other of various forms of treason. Republicans linked the success of the PRC's intelligence operation to illegal campaign contributions to the Democratic National Committee. Democrats claimed that the spying began in the eighties during the Reagan-Bush years. Neither side was clean, so they needed a scapegoat. In comes Wen Ho Lee. 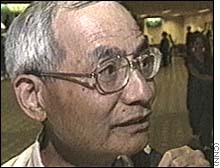 Wen Ho Lee is a scientist of Chinese ethnicity who worked at Los Alamos. To follow the rhetoric, he's also the master mind of a devious plot to rob America of its nuclear superiority and destroy America's ability to nuke the world. He's also a father and husband. He is currently being held with out bail and is allowed only one visit from his family per week. According to his daughter, this is the first Christmas the family hasn't been together for. Naturally, Wen Ho Lee is innocent until proven guilty, isn't he? So why is he in a prison and isolated from his family? Is this how we treat innocent people? Wen Ho Lee's life has been destroyed. There is absolutely no question that his ability to live and work in the future is dead. For the rest of his life, he will be guilty of selling American secrets, regardless of the outcome of the trial. Lee is now sueing several government agencies for launching what he considers an assault on himself and his family.